From the makers of some of the world’s most legendary guitars comes the Fender Mustang I V.2 guitar modelling combo amplifier. The Mustang gives you robust amp modelling and build in a slick, vinyl-covered package that can be taken with you anywhere without compromising on power. 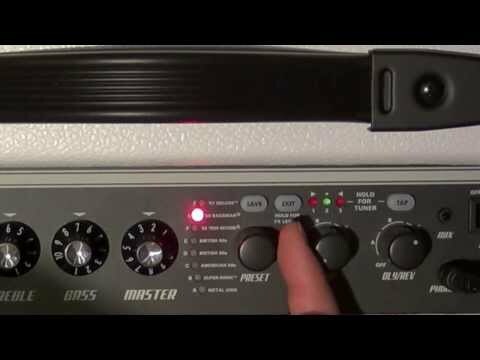 Easy to use, the Mustang I contains 24 amazing digital effects including intelligent pitch-shifting, but being a modelling amp, you have an entire collection of amplifiers at your fingertips including previous Fender amps as well as other classics. The amazing sounds produced by the Mustang 1 V.2 can also be captured right into the supplied version of Ableton Live Lite 8 or any other DAW via USB so you can layer your favourite guitar sound on to any track, and thanks to its headphone socket, you can play and practice silently when required. There is even an aux in for an iPod or other audio source for you to play along with. The Mustang I V.2 gives you ultimate control from the topside panel, including Gain, volume, preset select, modulation and delay select, and a tap tempo button. All this gives you total ownership over every aspect of the Mustang. Shaping your tone couldn’t be easier, and as we all know, Fender effects are truly sublime. All the sound generated is processed through the internal high-quality amplifier that can handle all the playing time you can throw at it and pumps it out through the 8", 20 Watt speaker. This rugged amp has the all the power, tones and looks that you need to practice, perform and record in one neat package that will never let you down. If you’re looking for a powerful, versatile, easy to transport combo amp that is great for both practising and gigging – and won’t leave a dent on your pocket -, then the Fender Mustang I V2 guitar combo amplifier is an absolute must have. Posted on 24/10/2017 by Strat Man I bought this amp on Monday 23/10/17. I got such a fantastic amp with all the presets and sound effects, spoilt for choice as they were all brilliant. I downloaded Fender Fuse and got even more sounds, it comes with a USB so you can play through your PC. Every sound can be tweaked to your own personal sound and saved, when you first switch it on the only knob you need to adjust is the Master volume. I recommed this amp to anyone wether you are a beginner or experienced, plug it in switch it on and be amazed. Rock on! Posted on 03/05/2017 by Megawhat? I researched this amp on the net and was convinced it was a good buy, as no one seemed to have a bad word to say about it. I'm not an expert on all things electric guitar etc., as I only got my first one about 6 years ago after a lifetime playing acoustic. There's a wall of technology with this amp to enable it to do what it does so well, but don't let that put you off. I downloaded the advanced manual and just got used to the workings of the amp itself, before trying the awesome array of effects and settings that can be downloaded into it, and I've only just scratched the surface of this side of it. Doing it this way, systematically, greatly speeds up the understanding of the computerised workings of the amp, and it all soon makes sense. Just give yourself time if you're not a geek in this field. The sound from the Mustang is great for the size of it, and very adequate for home or small gigs. It gives endless pleasure trying all the settings available, and frankly, I don't think you'd ever get to the end of the possibilities and combinations available - but that just gives you something to look forward to every time you use it. No matter whether you play blues, country, rock or jazz etc. etc. it's all here in this one amp, so this can save you a fortune, and you can download the sounds of your music heroes amps type and settings straight into it so you can sound the same. Amazing !! Highly recommended. Posted on 30/12/2016 by Pollyann Very good amplifier for the price with lots of different settings. Posted on 16/06/2013 by Neal Picked up this amp purely for practice at home and I am very impressed. Has a large number of pre-programmed effects which you can alter and save as per your need and preference. Well worth the money!